Although the pre-E3 stage is today being taken up by rivals such as Microsoft, Sony, Ubisoft and EA, Nintendo has taken the opportunity to release a host of new trailers for titles on the way to both Wii U and 3DS. Some of these titles appear to be new reveals, too, expanding the list of intriguing titles on the way to the eShop platforms. Without further ado, below are a host of fresh titles being shown off by Nintendo for the first time. A sequel to the hugely popular 3DS eShop title, this one looks set to have new stage ideas such as on-rails sections, flipped gravity and even a dinosaur boss fight. Originally developed for PC, this is a stylish platformer in which you utilise the top and bottom of the screen, with ambient music accompanying you all the way. Previously shown at an industry mixer, this is a clever-looking puzzle game coming to Nintendo's system as well as Xbox One, PS4 and PC — it looks particularly tricky, and co-op play is the recommended way to tackle the experience. A follow up to the DSiWare original, this is a flying combat game on the way to 3DS. Flying around and shooting everything seems to be the order of the day, which could be fun. This is a rather charming Metroidvania adventure that achieved success through Kickstarter. It certainly looks the part and is worth watching. The second part to Renegade Kid's 3DS remake has been shown for the first time, continuing the story at a lower price point than the first part. So there you have it, a look at more games on the way to the Wii U and 3DS eShop stores. Which ones have caught your eye? Gunman Clive 2? Ohh snap. 6180 to the moon also looks interesting. I thought Nintendo wasn't doing anything at E3 today. What is their schedule? 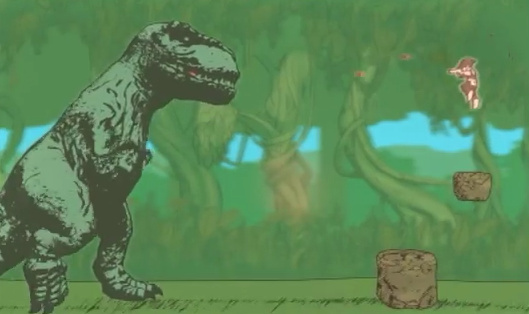 Gunman Clive 2 looks crazy good. Maybe Gunman Clive 2 will take longer than 45 minutes to beat. That was my first and only time playing the original and includes finishing with Clive and Duck mode. One of the easiest, breeziest 2D platformers in recent memory... Hopefully this has some more challenge and meat, otherwise I will probably pass. It's little more than serviceable 2D running and gunning. Ohhhhh snap. I need the first Gunman Clive now. Gunman Clive 2 and A.N.N.E. look really interesting, but I'm also curious about 6180 to the moon (I read it out as six-one-eighty to the moon, sound like a Tony Hawk thing). Gunman Clive 2... unexpected, but AWESOME! Nintendo is already close to winning E3 (at least if Sony won't give us more information of Kingdom Hearts III). All aboard the hype train!!!!!!!! Man, Gunman Clive 2 seems poised to deliver everything I missed from the (excellent) original game, with better use of color and what seems to be a larger-than-life, time-spanning storyline. Super stoked! Gunman clive 2? I'm sold just by the name. Hope it's also $2 or maybe $3 and they don't take the same path as other indie game series on eshop. Gettin all the lovely little indie games out of the way today to focus entirely on 1st Party tomorrow! And it looks amazing. THANK YOU BASED BERTIL. Uh, there are way more trailers that were posted.. Cubemen 2, STARWHAL, Armillo..
Wow, I had fun with Thorium Wars back in the day. I just may have to buy part 2 if it's good. Looks like they got rid of those freaking tank levels, too. Gunman Clive 2 and A.N.N.E. look like must-have titles. @PinkSpider I'd look again if I were you. I didn't even know there was going to be another Gunman Clive, so this is great news! Way for Nintendo to release some indie trailers early to wet our appetites. Looking forwards to gunman clive 2.
so happy with Gunman Clive 2 (haven't even looked at the others yet). That guy is a genius. What wonderful news. Seriously, though. Take a look at Nintendo's YouTube page. There are a TON of new games for the eShop and 3DS and Wii U retail. Gunman Clive 2, awesome. And it looks 300% bigger and varied than the original. Great! Yeah, and so many look really, really good! @ACK Even at that it is far better price to game than say NSMBU. Xbox E3 failed big time the ball's in nitnendo court now they will mop up as a lot of games on xbox and ps4 are the same. Fingers crossed Nintendo go all out tomorrow. 5pm uk time. I'm all for Gunman Clive 2 so long as they control the cost of the game. What about that cool-looking Steampunk schmup that's supposed to be coming over to the West? Chariot actually looks pretty cool, especially for co-op. ANNE looks good too but I already knew about it from Kickstarter. @Luna-Harmony. It was an okay conference, much better than thier last one. But they teased with Conker and didn't announce what Rare is doing. Unless if it is one of microsofts unnanounced games. Honestly, I dont think Nintendo will deliver. At least, I don't think there will be any 3rd party. Gunman Clive 2 !!!! Best news I've read all day!!! Although, I'm still curious if Bertil Hörberg is still working on this game. Yes! Gunman Clive is getting a sequel! The first one was one of the best games on the 3DS and this one looks even more awesome! No. He confirmed the RPG's cancellation on his twitter account. Interested in Gunman Clive 2. It's value looks too high to sell for $2 this time though. I'd buy it at just about any price but I'm afraid fans will be weary of it if it cost as much as, say, NES Remix or even Steamworld Dig. When I read "(...) this is a flying combat game on the way to 3DS. Flying around and shooting everything (...)" and saw preview on the video I immediately clicked it. Then I saw the bland, uninspiring and almost N64 graphics with dull textures and my hype disapeared. Though if the gameplay is good I may give it a try. For now I'll stay with my precious Ace Combat (for 3DS). I guess they finally want my money. There are so many more on Nintendo's Youtube page. Check it out. So excited for these. Especially Nihilumbra. Thorium Wars and ANNE have my attention. Gunman Clive looks good, but I wanna pick up the first game first. Very hyped for Gunman Clive 2 and ANNE, though I don't have a Wii U for that. Also glad to see Frima as a developer for the eShop; I remember they made quite a few great digital games for the PSP PSminis. Thorium Wars looks more fun than AiRace. At least you do more than race a clock. Really looking forward to Gunman Clive 2 and A.N.N.E.!!! Seriously though this is really awesome news! Gunman Clive 2 looks great! Someone above said that they wished the game was longer, but I enjoy being able to pick the game up and clear it in 30mins to an hour. a gunman clive 2? definitely!!!!!! I can't wrap my head around all of the love Gunman clive gets, it's quite possibly one of the boring platformers i've ever played. It does nothing new, it looks awful with it's cheap barren & empty cell shaded cowboy I-phone visuals and the soundtrack is boarder line annoying. Not convinced at all by the sequel. I'm sure a blind folded five year old could finish it in their sleep. It was lifeless depressing experience for me, one that i'd like to forget! A.N.N.E and Charriot look like they have potential. Plus I am interested in checking out Moon Chronicles mainly because of it's FPS stylus controls and because it's the first FPS on the 3DS with stereoscopic 3D. @WaveBoy A good way to forget an experience is to not talk about it every chance you get. Try it out! It's so bad, that it has infested my mother brain and battletoads beyond. It won't go away. I've officially got the Gunman Blues. Gunman clive 2 yes looks amazing just like the original cant wait. I'm considering Clive. Moon looks good, but probably not for me. Chariot has caught my eye Hard. A.N.N.E. looks pretty sweet! I loves me some Metroidy style games. I've never played Gunman Clive or Thorium Wars, but I may have to check out both of the originals, especially Thorium which look like it is as close to a new Star Fox game that, seriously, WE WILL EVER GET AGAIN!.. Its good to see the downloads already, since it makes space for other stuff at the Digital event! However, some of them look nice! Before showing Moon Episode 2, what about a release of the first episode in EU, guys ? Okay, the dinosaur fight was strange enough, but Gunman Clive is going to manage to take out a huge gunboat cannon and a steam-powered mech with nothing but a revolver?! How does that work?! This Thorium Wars intrigues me, especially in the absence of Star Fox or Rogue Squadron in recent years. Gunman Clive 2 will of course be a must-buy for me. I loved the first one, and its sequel looks so rad. So does Anne remind you guys of cave story or what?? ?